Meet MURPHY. He is a BIG and LONG 3 year old brown tabby male with a perfectly SYMMETRICAL face and light greenish/yellow eyes. We took Murphy into our shelter after Murphy’s owner moved and wasn’t able to take him. Now our goal is to find Murphy a loving home that he can call his own. Murphy is FRIENDLY, OUTGOING and AFFECTIONATE. He loves to be PET and he will RUB allover you because he is so appreciative of the ATTENTION. 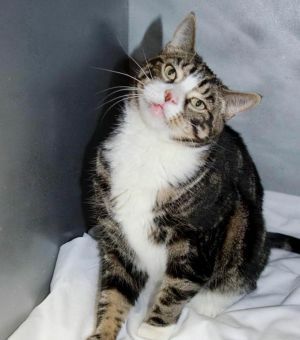 Murphy has a tendency to be dominant with other cats, so he’ll need a cat that can stand up to him. Otherwise, he would be the ideal “only” cat. Come and meet Murphy. We guarantee that you’ll fall in love with him. He is in residence in Westchester, NY. He is neutered, UTD on shots, and FIV/FeLV negative.